In 2014, USFWS was petitioned to provide protection to the monarch butterfly that has seen over a 90% decline in populations. 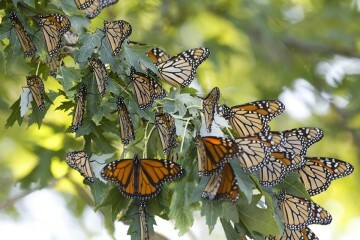 Primary contributing factor to the decline of the monarch butterfly is the loss of milkweed habitat. On September 28, during the peak of monarch migration, National Fish and Wildlife Foundation (NFWF) announced the recipients of the 2015 Monarch Conservation Fund grants. Out of 115 proposals, NFWF chose 22 recipients representing over $3.3 Million dollars awarded. The Burroughs Audubon grant was a collaborative effort between Burroughs Audubon, with the support and endorsement of The Kansas City Native Plant Initiative, and its partners. The Kansas City Metropolitan Area Monarch Butterfly Conservation: A Multi-Sector Partnership grant was awarded $229,868 and will create unprecedented cooperation, awareness and creation of monarch habitat across the KC area.